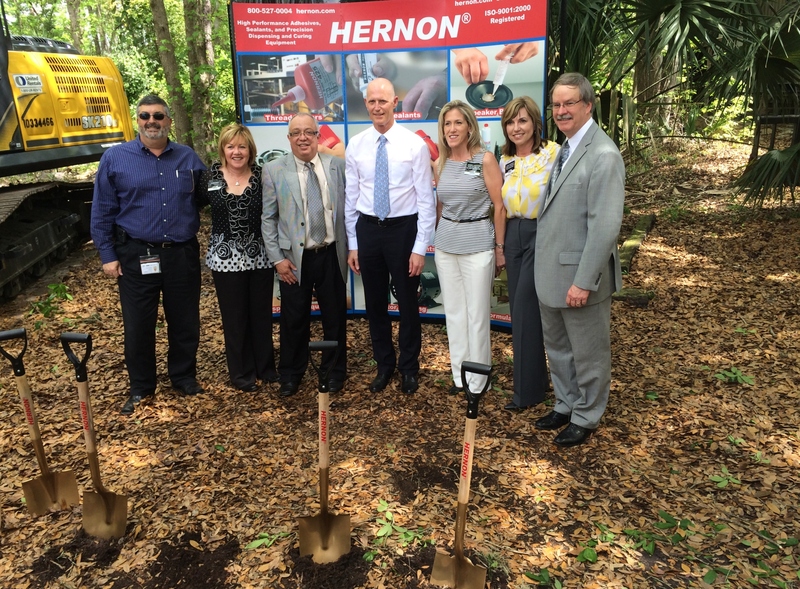 Hernon Manufacturing, a global manufacturer of adhesive sealants and dispensing equipment, held a groundbreaking ceremony for its expansion project at the company’s headquarters in Sanford, Florida. This will add 27,000 square feet of additional space to their current building space to support the expected increase in business in the coming years. The company will add up to 20 new jobs within the next two years. Governor Rick Scott led the ceremony along with Hernon’s president and chief executive officer, Harry Arnon. Arnon credits the possibility for Hernon’s expansion to Gov. Scott’s tax cut on manufacturing equipment, as well as Florida’s advantageous climate for business. As a long-time member of Central Florida’s industrial manufacturing community, Hernon offers strong brands and technologies, all made in the United States. In addition to custom and standard dispensing and curing equipment, Hernon Manufacturing produces and distributes an extensive line of sealants for military and commercial use.